Nearpod is launching 3D Virtual Field Trips and also offering an opportunity to apply for classroom viewing kits. This Wall Street journal article, Virtual Reality Learns How to Get Into the Classroom, provides some interesting background on the project. 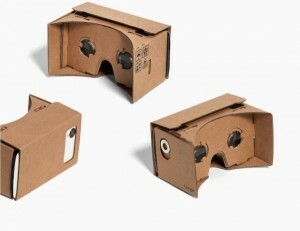 Of course, Google Cardboard is in the 3D Virtual Reality biz too. There are lots of apps and services producing content for these viewers. The New York Times is promoting their 3D content by sending subscribers a viewer for free. Which is how I ended up with one. If you’re note familiar with these, they’re folded up cardboad viewers, kind of like the old fashioned ViewMasters of my youth. They have 2 lenses in them that create the 3D view. The images you view are provided by apps on your smartphone. You pop the smartphone in the slot in the box, hold it up to your eyes and as you move, the 3D image moves with you. Fun to do in a swivel chair! The first images I viewed did make me a little dizzy. I’m not sure if it’s because I wear glasses? Or if I just tend to get dizzy easily. With the recent introduction of the Cardboard Camera app, anyone can produce a simple 3D image for viewing. Great for immersive vacation panaoramas. I used it to take a 3D image at my local library the other day and when a friend asked how some house renovations are going, I was able to share some 3D pics of the project. Cool. So, how would you use this in the classroom? Google is piloting a project called Expeditions where a teacher with a tablet can lead up to 50 students with viewers through 3D immersive field trips. Nearpod will be incorporating them into their lessons, I checked out their free Mars exploration lesson and was able to view it in the Google Cardboard viewer. You can follow news stories via the growing NYTimes VR collection. Explore Mars! And so much more. Next Next post: kiddle, kidrex, search engines for kids?